Monterrey, Nueva León, Mexico. - Less than 24 hours after forcing RGV Barracudas FC into a shootout, the Ontario Fury fell victim to its heavy legs, a determined Monterrey Flash side and the attacking heroics of Franck Tayou on Monday night, suffering a 10-5 loss in part two of its four-game road swing in Major Arena Soccer League (MASL) play. While the Southern Californians put up a fight for long stretches of the contest, the Flash would bag the victory thanks to a stretch of seven consecutive goals over the course of the third and fourth quarters. Monterrey forward Tayou, who had already dominated in his team's overtime win against the Fury a month ago, put on another attacking clinic with three goals and one assist on the night. Ontario quickly grabbed the 1-0 lead on a restart in the opening quarter, Victor Quiroz laying the ball off to Evan McNeley, who released an absolute rocket from way outside the box that left goalkeeper Diego Reynoso without a chance. However, Franck Tayou was unimpressed and subsequently scored twice to give his own side the lead. First the bulky Cameroonian finished off an assist by Brayan Aguilar. Then he displayed ridiculous footwork at the left post, freeing himself from a Fury double team and smashing a powerful blast across the frame and inside the right post to make it 2-1. While Andy Reyes tied things up before the end of the period, Quiroz laying the ball off to his teammate on a set play, Ontario had goalkeeper Chris Toth to thank for preventing another Monterrey lead in the second quarter. 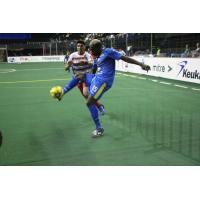 The former San Diego Sockers man came up with an excellent one-handed reflex to slap the ball over the crossbar on a wicked deflection off the boards. However, Toth would be left helpless shortly thereafter, as Miguel Vaca displayed perfect aim in sending a powerful drive inside the right post. Following intermission, it briefly seemed as though the Fury might have enough left in the tank to make life difficult for the Southwest Division leaders, Thiago Goncalves picking out McNeley for the equalizer and Ontario captain Israel Sesay pouncing on an unforced error by Erick Rosas to make it 4-3. However, the more rested side ultimately prevailed, as Monterrey scored the first four of its seven straight tallies before the end of the third period. First Roberto Escalante touched home the rebound when Fury 'keeper Toth tipped a Daniel Lopez attempt off the boards above his goal. Then Rosas made it 5-4 in favor of the Flash and Uzi Tayou doubled the home team's advantage by tapping home Edgar Flores' pass on a perfectly executed counter-attack. Rosas would also round out the quarter by bagging the Mexicans' seventh on a setup play by Edgar Gonzalez. The two side's netminders exchanged quality saves to open the game's final period, with the Flash's Reynose quickly dropping low to deny a wide open Sesay and Ontario's Toth producing a stunning kick save to keep out the attempted finish by an equally open Edgar Flores. The Fury 'keepers efforts would not be enough to prevent three more Monterrey goals before the conclusion of the match. After Edgar Gonzalez received the ball from Damian Garcia and fired a low missile inside the right post from near the center circle, Toth had to to rush back from joining the Fury attack and underestimated the pressure put on by Franck Tayou, who won the ball and ruthlessly passed into the unguarded net to complete his hat trick. Tayou would add his fourth point of the contest moments later, setting up Jorge Rios for Monterrey's tenth and final tally. Maicon de Abreu's finish on the assist by Sesay served as little else but consolation for the Ontario players, who will travel to take on the San Diego Sockers and the Tacoma Stars on Sunday, March 10, and Friday, March 15, respectively. Currently locked in a neck-and-neck battle with the Stars in the hunt for a Pacific Division playoff berth, Head Coach Jimmy Nordberg's men return home for a crucial meeting with the El Paso Coyotes on Sunday, March 24. Tickets to all Fury games at Citizens Business Bank Arena may be purchased by by visiting www.ontariofury.com or by calling 909-457-0252.